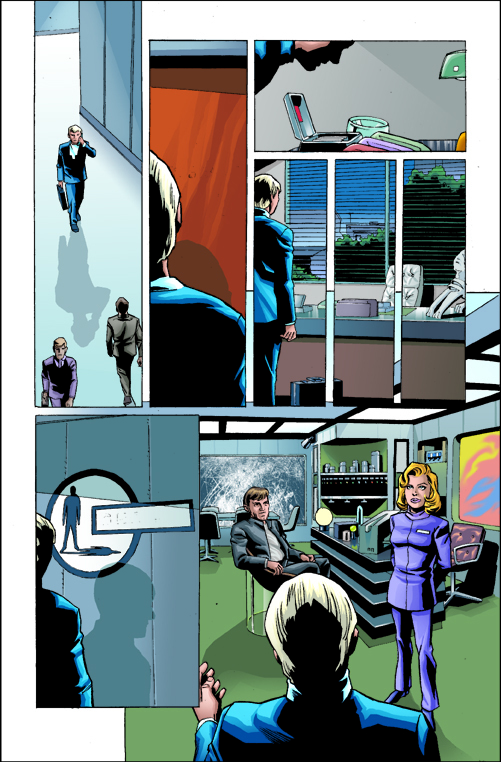 Here’s a glimpse of a comic that never happened, a comic based on Gerry Anderson’s UFO, a 1970 live-action British Sci-Fi series from the same producers as Space: 1999 and Thunderbirds. A comics publisher had secured the rights to a comic book adaptation, and a 7-issue mini-series was mapped out. Issue #0 would have taken place immediately after the TV series, and would have essentially acted as a series finale. Issues #1-6 of the series would have picked up more than a decade later, acting as an epic sequel to the TV show. The pencils, inks, colors and lettering were completed for the #0 issue, and pencils to #1 were underway when the plug was pulled at the publisher end due to lack of funds – another project that had been expected to fund this one hadn’t been the success that had been hoped for, and the money to produce and publish the mini-series wasn’t there. Valiant efforts to save the project were made, but the whole thing just folded. I’m happy to say I was paid for the work I completed, but I really wanted to see this project reach an audience. The inks on the book were by Joseph Rubenstein whose work I’d known from everything from the Official Handbook of the Marvel Universe to some of John Byrne’s issues of Captain America. The colors were by colorist Matt Webb. 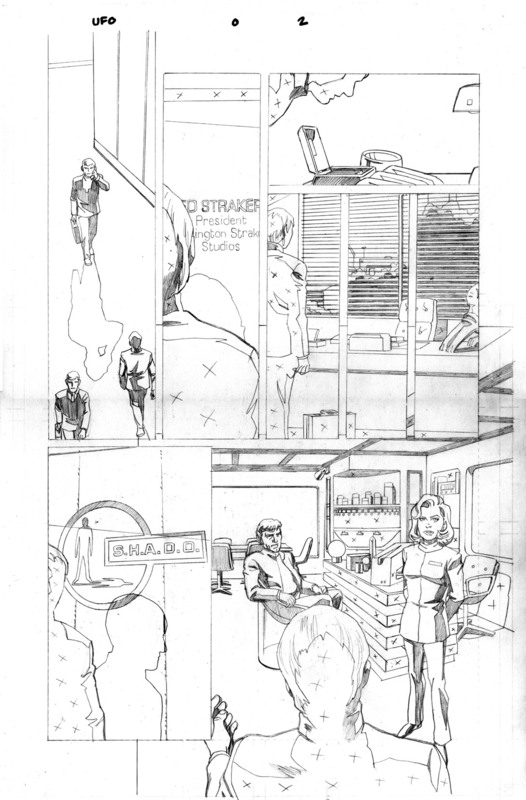 Page 1 – This opening page shows Commander Straker’s futuristic car (this was taking place in 1980 after all!) pulls up to the Harlington-Straker Studios building, the ground-level cover for the secret underground headquarters of SHADO, covert defenders of the earth from alien invaders. One wonders if they coordinated their efforts with UNIT. In the shadow of Straker’s car (shadow/SHADO – get it? GET IT?) we see some of the vehicles depicted with fabulous model work on the show, the hallmark with Gerry Anderson productions of the era. As I have a copy of the lettered version of this page, here’s a look at what the finished page would have looked like. 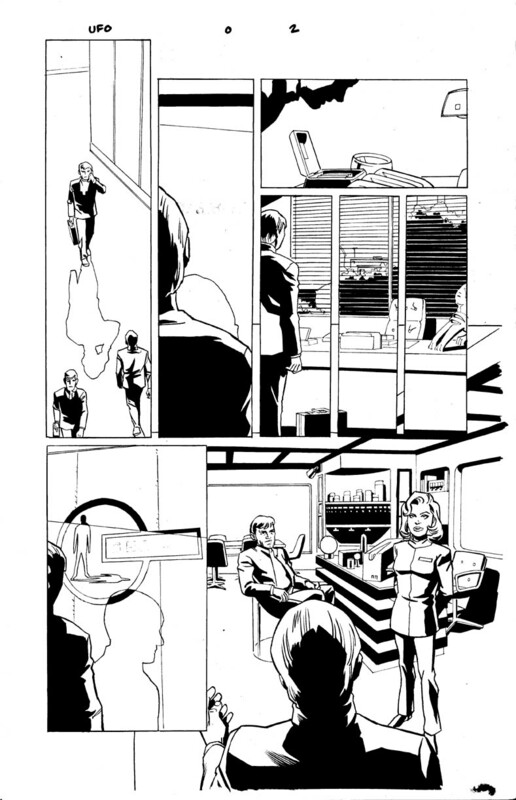 Page 3 – SHADO operatives talk business in the office of Ed Straker (played by Ed Bishop). We had the mixed blessing of being able to use likenesses of the cast of the TV show, which was great from the sense of making the comic look and feel like the show, but it meant having to work from photo reference which is time-consuming and limiting. I was looking forward to the issues that would be set more than a decade later, which would allow me to get further away from photo-realistic likenesses of the actors. More of those spiffy Gerry Anderson vehicles can be seen in the last panel. I’m like the little touch of the shadow being cast on the cloud below. You can see Part 2 of this post with pages 6-15 here.